IT'S TOFFEE'S TURN: IT'S AT BOILING POINT - WILL THE VOLCANO ERUPT? IT'S AT BOILING POINT - WILL THE VOLCANO ERUPT? HOW WILL NAJIB REACT TO SAVE HIMSELF? WILL THE PROTEGE USE TRICKS LEARNED FROM HIS MENTOR AGAINST HIS MENTOR MAHATHIR? 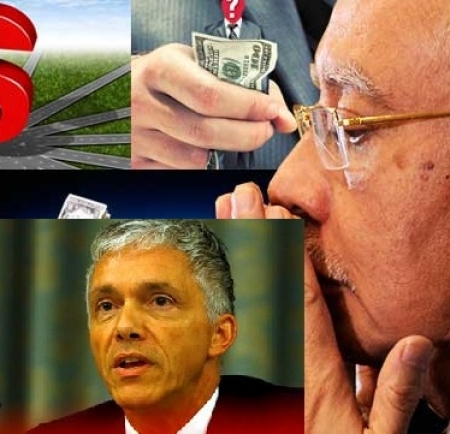 about the 1MDB scandal and the moneys of that fund in his bank account and after all those excuses and reasons have been rubbished, and as Najib and his henchmen have run out of excuses even the stupid ones, what does Najib do? The accounts of the Swiss Attorney General Michael Lauber have only strengthened the case against Najib confirming what Sarawak Report had alleged, and rubbishing what the Malaysian Attorney General has said so far whilst waiting for Apandi to send him the details about the fund he had promised to send to facilitate the investigations and even offering Swiss expertise if Malaysia lacks it. 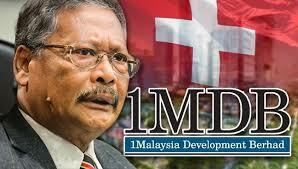 To think that huge amounts are alleged to have gone into his own pockets makes it even worse especially at a time when the rakyat have been slapped with rising costs caused by the depreciation of the ringgit, his implementation of the Goods and service tax, and the removal of subsidies. The talk on the street is that these measures have been implemented to recoup the monies lost and taken from the 1MDB sovereign fund. As I went fishing in Batu Laut near Morib Selangor with one of my old colleagues last week, one villager had this to say, "we are finished we have to pay for stolen money to enrich him and his family, rice has gone up, petrol has gone up, everything has gone up and even bus fares for children going to school has gone up, we are finding it hard to make ends meet, and if he does not step down we are just finished." he was angry as he even suggested other ways of getting the PM out. That was my own experience of the anger of the rural Malay, he was really furious when told that we'd have to wait for the next elections. As I was driving back I began to think of what could happen, the March 27 gathering being prepared by Zaid Ibrahim has already kicked off with the news conference held by Mahathir, whilst Muhyiddin and Mukhriz are planning a nation wide road show to explain the truth to the people and with this in place Najib will face some real threat to his position I thought. What would happen if Muhyiddin, Shafie Apdal and Mukhriz are able to muster huge rural support to rally against the PM? Then I asked my self again is he (Najib) even expecting such a scenario and what would he do if he is faced with one. For Najib is not as simple as it was with Abdullah, he just can't simply walk out, there is so much now to consider, had he done it earlier Muhyiddin may have covered up for him, so too would have Mahathir, but now if all the allegations about him are true he can't give up he must fight to the end and he may have a personal war chest with billions of Ringgit to do just that. The allegations are of a criminal nature and could involve almost every member of his family, and the knives are being sharpened, Mahathir is an angry old man too especially after what happened to his son. against Najib Tun Razak, and to make matters worse, he removed the Attorney General and replaced him, a move believed to be done to neutralise his (Najib's) own arrest, he has replaced him with a crony who had even the audacity to ask the MACC to stop investigations against Najib and declared that Najib had no case to answer only to be proved wrong by the Swiss Attorney General who is still awaiting the cooperation of Apandi over money laundering involving 1MDB funds. The judiciary , the police and the attorney general's chambers seem to be under his control, very soon it is envisaged the National Bank will come under his control when he proposes the new governor to the King. He has begun making moves to amend the already Draconian Official Secrets Act to make punishments under the act even more severe, in fact his attorney General even suggested life imprisonment. This is an indication of the level of desperation the AG and he are now under. So what will Najib do now as the noose tightens. Najib was after all the protege of Mahathir Mohammed and he really learned a lot, he is now the master of Mahathirism and he is about to teach his mentor a few tricks. WILL THE PROTEGE TURN AGAINST THE MASTER USING THE MASTER'S TRICKS? My thoughts go back to the time in 1987 when On 27 October 1987, Operation Lalang was carried out. their publishing permits suspended. The Star at that time was one of the two main English newspapers that provided news more from the Opposition’s point of view. 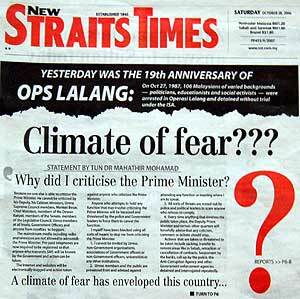 This was considered treason, and during Operations Lalang, this newspaper was shut down. Politicians, activists from NGOs, Muslims who had converted to Christianity were all arrested under the Internal Security Act . Among the more prominent detainees were the opposition leader and DAP Secretary-General Lim Kit Siang, ALIRAN President Chandra Muzaffar, DAP Deputy Chairman Karpal Singh, MCA Vice President and Perak Chief Chan Kit Chee, Dong Jiao Zhong (Chinese Education Associations) Chairman Lim Fong Seng, Publicity Chief of the Civil Rights Committee, Kua Kia Soong. PAS Youth Chief Halim Arshat, UMNO MP for Pasir Mas Ibrahim Ali and UMNO Youth Education Chairman Mohamed Fahmi Ibrahim. 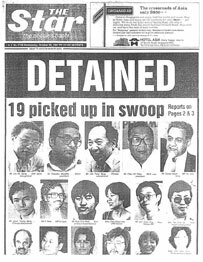 Although most of the UMNO detainees were released either conditionally or unconditionally, 40 were issued detention order of two years this included th elike so of Lim Kit Siang and Karpal Singh and other other party colleagues, PAS members and many social activistsincluding the then Aliran's Chandra Muzaffar Shah. I also remember the detention of a friend of mine from Shell, he was a Malay who had converted to Christianity, and he was detainee only for that reason under the ISA, I have not heard of him since and I shall not mention his name all I'llsay is that it began with the alphabet H.
alleged timber concession valued at RM30 million (very huge at the time), awarded by Najib, then the Pahang Menteri Besar to a man living in a low cost house. After the Ops lalang the issue was forgotten as Kit Siang was behind bars. MCA's deputy President at the time Lee Kim Sai, was inline to be arrested but he escaped to Australia and it is rumored that he was pre-informed to save embarrassment in the BN. Najib is probably the best student of Mahathir Mohammed and he has proved to be so, the protege has proved that he is capable of outdoing his mentor and so looking back I am wondering if the heat really gets unbearable, will Najib have an Operations 1MDB along the lines of Operations lalang or even a bigger and a more extreme sweep. CAN MALAYSIANS TRUST AUSTRALIAN GOVERNMENT?